In 2003, my wife and I moved from Virginia to Georgia. My weight was already over 300 pounds. I was having a lot of problems with my knees, feet, and back. I had arthritis, high blood pressure, gout, and diabetes. By 2006, I was having so much trouble that I often could not walk without using a cane and was also having some trouble with my heart. My cardiologist, rheumatologist, and family doctor were all telling me I had to lose weight. My health was so bad I was put on disability. By that time, I had cellulitis in my legs, and my left leg would swell horribly. If I bumped it against anything I would get open sores that were hard to heal. This resulted in two surgeries on my leg, which didn’t help much. By 2013, I was in really bad shape and not very happy with myself. I weighed 370 pounds, was wearing 4X shirts and 56 to 58 inch waist pants. I had trouble finding shoes and clothes to fit me. My knees were giving me a lot of trouble and hurt all the time. I went to see an orthopedic doctor about getting knee replacements and was disappointed. He said he could do surgery, but I needed to lose some weight first. He suggested I look into weight loss surgery, and I felt like I really didn’t have much choice. I went to one of Dr. Sanborn’s seminars. After the seminar, I asked him some questions, but still was unable to decide. I just could not believe I would be able to live on only four ounces of food per meal. Dr. Sanborn suggested I go to a support group meeting and talk to those who already had the surgery. At the seminar, I met a young man that was a chef. Before surgery he weighed 600 pounds and had lost over 400 pounds. I asked him how he managed to stick to the meal plan. He said it was like an alcoholic working in a liquor store — it only bothered him on days he had to fry a lot of chicken. I thought if he could do it, then there was no reason I couldn’t do it! I made an appointment with Dr. Sanborn and started all the testing for surgery. I lost about 25 pounds before surgery, and we decided the gastric bypass would be the best for me. 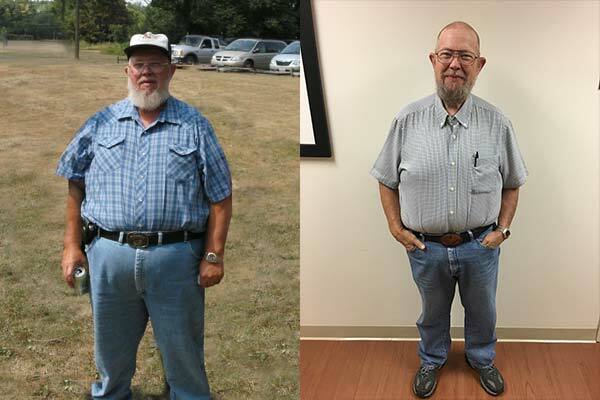 I underwent surgery on April 1st, 2014; one year later I had lost over 100 pounds, was no longer taking medication for my diabetes, reduced other medications, and no longer had to use a CPAP machine while sleeping. After about 18 months, I was able to have my left knee replaced. Two years after surgery, I was down to 175 pounds and I felt great! I was wishing I had done it when the doctors first discussed weight loss surgery with me. On September 11, 2017, I had my right knee replaced, and unfortunately, had a lot of complications. It was almost three weeks after surgery before I could start rehab and well after January before I could start exercising again. I had gained 15 pounds during all of this and was scared I was on my way back to 300 pounds. I knew I needed help. I am now going back to support group meetings regularly and seeing the dietitian, determined to get those 15 pounds off again. Before surgery, I could not understand how someone could live eating such a small amount of food, and now I don’t see how people can eat more than I do. While I have lost close to 200 pounds, I have gained so much more!